We are Manufactures & Wholesales of Online Store of Bridal Lehenga Sarees. Our range of Fashion Designer Sarees is one of the most popular impressive saree collections in our catalogue. This saree is highly demanded by our clients all across the world as these are developed under the guidance of our team of creative craftsmen. Clients can avail from us an alluring range of Designer Saree, which comes in various styles, prints and elegant color combination. Efficiently crafted by our designers, these screes enhance the look of the wearer. The range is ideal for daily wear, in office as well as in wedding and diverse festive occasions. 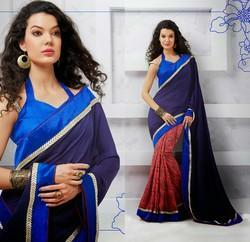 Our domain expertise has enabled us to offer an alluring range of Party Wear Sarees. These are exclusively designed for women to enhance their beauty. The range of our sarees is available in various designs and colors to meet the specific requirement of the clients. Being a client centric organization, we are engaged in offering the finest collection of turquoise and maroon lehenga style saree. These sarees are embellished with sequins and patch work and broad embroidered patch all around them. An outstanding collection is ready to make you sensation in this wedding season. Extraordinary beautiful sarees are having amazing work of colorful sequins, stones, beads, pearls, coins with jari and resham embroidery. Our range of Cute Designer Saree is available in exclusive designs and in beautiful Red color. These Designer Sarees are widely appreciated for its very soft, elegant, sophisticated and delicate texture that makes it comfortable and add a beautiful look at the same time. Avail from us a stylish range of designer sarees, which are creatively crafted by one of the expert hands of industry. These designer sarees are very comfortable to wear and are very appealing in look. We have acquired a rich and sound experience of manufacturing, supplying and exporting a wide spectrum of Fashions Evergreen Designer Sarees, including Fashionable Crepe Designer Sarees to our valued customers. These are manufactured by using the best grades of fabrics, blends, and threads. We use high end technologies to manufacture these in our latest manufacturing facilities. Our range of Sarees is acclaimed highly for intricate designs and impeccable stitching. We have teams of skilled designers to produce sarees with fascinating designs and vibrant colors in accordance with the latest fashion trends. We maintain stringent quality standards to offer a flawless range of these Sarees to our esteemed clients. 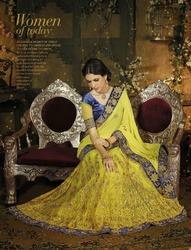 Looking for “Bridal Lehenga Sarees”?